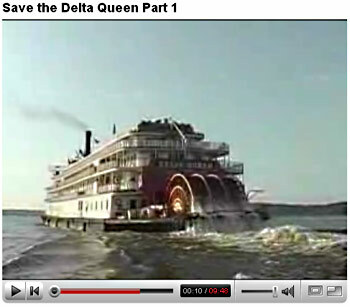 Save the Delta Queen Video – a must see! Don’t forget to add the vidos to your Youtobe favorites, vote for the video and comment it there. This helps to make the video more polular, hence more people will see it and will learn about the Delta Queen’s struggle for a new exemption from Congress! Added: Jazzou Jones has announced that $1 from the purchase of each of his "Ragtime Trilogy" music books will be donated to the production costs for Jon Tschiggfrie’s Save the Delta Queen video. See steamboats.org "Book of the Month" for more in this marvelous river buff collectible item. I hope. this steamer will run for a lot of years. The responible politicians should ask at some of the rare shipping groups in Germany, like the Hoehentwiel steamer museum which has its steamer in service and earns enough money in turism at the Bodensee (Lake Konstanz)by having restored and running the paddle steamer there. Or the Bayerische Seenschiffahrt Ammersee, which has in service 2 motor paddle vessels, built like old steamers. They earn a lot of money since these romantic paddlers are in service- because people prefer a real ship and not a swimming tin can. So do all, that this steamer will run! What an incredible effort! Now it is up to the rest of us to expose this message to the world, include these links in ALL your emails. If a picture says a thousand words, this is priceless! Thanks for the kind comments about Jonathan’s “Save the Delta Queen” video. Jonathan and his father are arranging to mail free copies of this video on DVD to appropriate Congress people, commercial and public TV stations along the inland rivers, and other individuals and groups who have an interest in preserving the tradition of overnight steamboating in this country aboard the historic national treasure, the DELTA QUEEN. If you can assist us with this campaign to educate people that the boat is indeed safe and deserving of exemption from SOLAS, please feel free to contact us with any contribution you wish to make. Jonathan has posted an address on the “Save the Delta Queen” forum on steamboats.org where you may contact us. Thanks for any help you can provide in getting the word out! The DQ needs to be saved for the next generation to enjoy. She’s certainly no fire risk to anyone & should be given an exemption from SOLAS. Having seen her come up the Ohio many years as I was a child leaves a warm spot for her that continues to this very day. Write your congressman & get out the word. This is what it will take to save this national treasure. Really interesting videos. I have never sailed on the Delta Queen but I have been on board The General Jackson at Nashville and can appreciate the beauty and historic value of this fantastic ship. Also the steel hull and engines of the Delta Queen were built Denny’s in Dumbarton Scotland which is where I was born and have lived all my life. My father and my grandfather both worked at Wm Denny & Son Ship Yard, Dumbarton, who were the biggest employers in the town alongside Ballantines Whisky distillery. I will make our local newspaper aware of this website . How sad to see the possible errosion of a great piece of our history. Seems like we’ve presented a great case for exemtion and I hope to see her taveleling up and down the Mississippi and Ohio rivers for many years to come! Please don’t heistate to make me aware of any way in which I may help. I’m trying to get in touch with Jon Tschiggfrie with regards to an article I’ve been trying to hunt down in White Tops Magazine. I know he used the Vol. I need when writing about the Delta Queen’s calliope. My e-mail is dawnrochelle@gmail.com. Can someone get me in touch with him?? ?